So wanting to dress like a famous black person is racist, but not so for a white? I see this happen all the time and yes I do not like how blackface was used back in the day. However some people are thinking maybe we are getting too offended over every little thing and saying this or that is racist, sexist, etc. Please be civil and explain your opinions on this. If one is white, one is racist. It's inherent in the lack of melanin. Sammy Sosa says everyone should just chill! The lightening of Sammy Sosa's skin, is a direct consequence of anabolic steroids. Some people grow back hair, or get acne. Others beat their wives. Sammy Sosa shared needles with Mark McGwire, that's why he turned white. 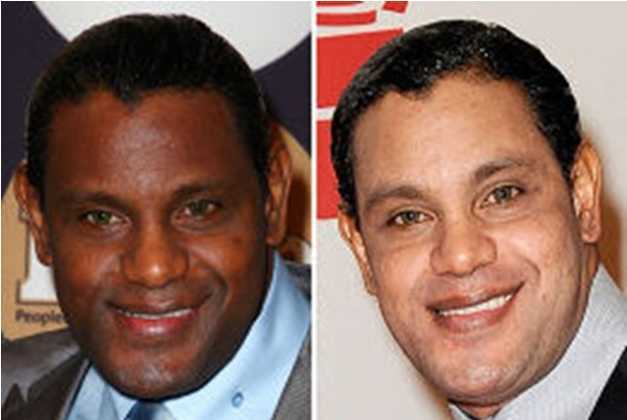 Either that, or Sammy Sosa is a human/fallen angel hybrid. Yes, there's lots of pc nonsense out there where easily offended types are combing the landscape for something to get offended by. But there also should be common sense - to not unnecessarily do or say something that you almost certainly know will be deeply angering, offensive or hurtful to people. And there are those so anti-pc that they feel the need to push people's understandably sensitive buttons just to prove a point, while caring less who they offend. Such people are prideful idiots, caring more about scoring a stupid point against what they see as PC nonsense instead of caring about deeply offending people. And then there are things that ordinarily might not seem a big deal, until some moron uses it to deliberately tick someone off. Unfortunately, this country's terrible, racist past has made, particularly people of color, hyper-sensitive to certain things that just a few generations back were universally experienced by their own relatives. Non-minorities often just don't understand it, can't see the big deal. But all the above said, there are many people who simply need to toughen up and stop the constant scanning every direction for superficial, irrelevant reasons (excuses?) to be offended over. Because if we look hard enough, we can all find some idiotic thing to get upset over. This here I agree completely. As for the hypocrisy of the PC crowd - it's unbelievable. NBC conveniently fired Megyn Kelly (of whom I'm no fan) over her comments about blackface Halloween costumes - mostly to appease the rabid PCers and also to distract the public from the fact that it's bosses (remember Today's Matt Lauer, etc. - and much like those at Roger Aile's Fox News), had long known of extreme sexual harassment (or worse) and yet did nothing about it. Course, it was also a way to get rid of her and try to save some money. Their news network trends liberal and now Megyn is toxic for them. And so the lefties piled on ready to crucify her, and her blackface comments made it easy for them. Ah, but where were those on the left when liberal celebrities dressed in blackface???!!! Every one of the following has done this: Julianne Hough. Ted Danson. Kylie Jenner. Sarah Silverman. Jimmy Fallon. Jimmy Kimmel. Other than quite a few of them are darlings of the left, how is it different? Jimmy Kimmel went way beyond in making fun of Karl Malone - probably because he's very conservative and he knew he'd get away with it. Point is, what is the difference and why didn't those in these videos have their careers ruined as well? Obviously, it depends upon WHO does it - if liberal, they'll likely be forgiven. If conservative leaning - the person's career will likely die. I think everyone just needs to stay away from such, as while it might be meant to be hysterically funny, it can really upset people and cause divisions - especially if it's done as mean-spirited or swerves too close to a despised stereotype. But my main point is that people are often hypocritical as to whose actions or words they are willing to criticize - as it is human nature to not criticize those who you more self-identify with or like. And that is the problem with political thinking - that one only criticizes select groups. So, what is the standard per what we should criticize or the humor we use? Granted, hypocrisy of the left is undeniable. But Meghan Kelly should have known better, or anyone else for that matter. Just a cursory search on the history of 'blackface' reveals that its sole purpose was to denigrate an entire race. It was historically (and still is) institutional racism at its core. It is indefensible. Tell me what in this video merits Megyn Kelly getting fired for racist comments. I believe the relevant part of the conversation begins around the 5:22 mark. Is dressing up as Diana Ross, the same as dressing up in blackface? Blackface is an insulting caricature of black people. Assuming one doesn't dress up as a blackface version of Diana Ross, why is that racist? Looks like this is probably just an excuse to fire her. The pc culture has become too much. Roseanne was fired for racist remarks, even though the remarks weren't racist. Now this? Edit: around the 4:07 mark, Megyn mentions blackface. I don't think she is referring to the same "blackface" that's intentionally a caricature. It seems to me that people are saying that she thinks "blackface" is ok, when it seems like she just meant putting on makeup to look more like a celebrity who is black. I don't disagree with you nor am I condoning firing her, I happen to like Kelly. All I'm saying is, given the history of what blackface has stood for over the years, and as a journalist and a public figure herself, she should have at least made it clear that she's not condoning 'blackface' in any way, even though she thinks it's okay for a white person to dress as a black celebrity or vice versa. That's all I'm saying. Is it possible that she really wasn't aware of the history of blackface before all this happened? I don't think that I live under a rock, and I wasn't aware of how racist blackface was, until a couple of years ago in a thread we have on this board. Maybe Megyn's show sucked. Maybe the ratings were tanking. Maybe the network couldn't justify paying her huge salary. But blaming her being fired because of racist comments is flat out wrong. PC culture has gone too far. 1. Yes, Meghan should have known better to unnecessarily blunder into a sensitive area with off-the-cuff remarks - but I don't think she's a racist. Insensitive and unwise, perhaps. 2. NBC was already looking for a way to unload her: PC culture + Meghan's ridiculous salary + her poor ratings + plus her comment making her toxic to NBC's news more liberal audience + NBC's corporate hypocrisy = "Your Fired!" Her apology shows she acknowledges the wrong in her circles. When she joined NBC that's she'd have known there are certain leftist SJW values. She broke a rule which affronted against such values -- it is not ok to for a white priviledged person to dress up as a person belonging to group deemed oppressed. So she deserves to be fired. It was just an excuse however, as her ratings are bad aren't they? She'll likely collect a nice paycheck on the way out. So it's really a win-win for her -- escaping the fire she jumped into loaded up with cash. So it's really a win-win for her -- escaping the fire she jumped into loaded up with cash. But, if she were loaded up with cash, trying to escape a fire, wouldn't the cash weigh her down? Plus, doesn't cash burn in a fire? I would think it would make more sense to try the stop-drop-and roll method, to escape a fire, instead of wearing a huge backpack full of cash.